… well, not necessarily “old cake” but rather, old photos. Of cakes that don’t exist anymore (because they’ve long been metabolised). You get the idea…. 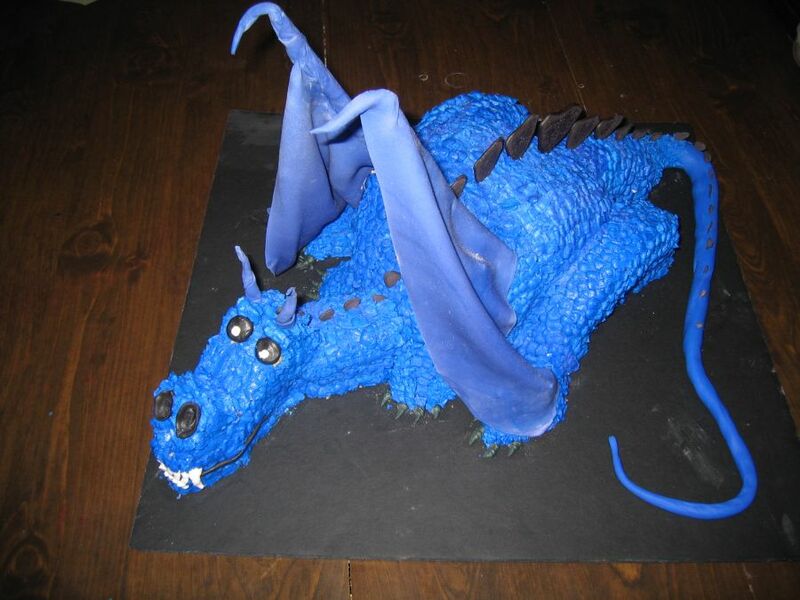 So here’s a dragon cake I made in…. I don’t know. We’ll say 2007. It was my first time ever using fondant (for the wings and tail), and I thoroughly enjoyed it. The scales are all buttercream, while the bony ridges along the spine are made of royal icing. 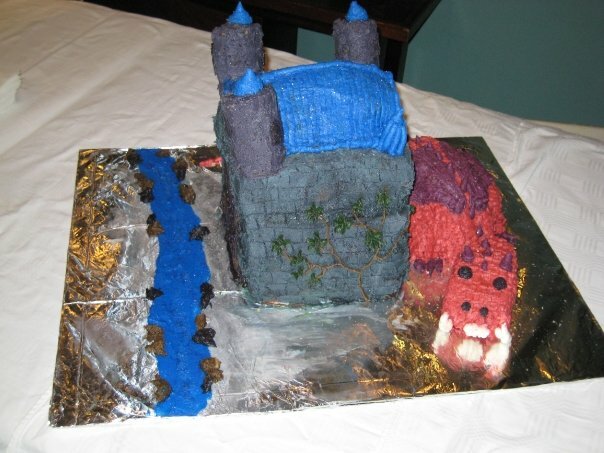 It’s my understanding that this cake was demolished at the birthday party. Hooray! This was a challenging cake. It looks simple enough, but the circumstances surrounding this cake were a real challenge. I had just arrived in Cape Town, South Africa, and was doing this cake for my long-time penpal. Unfortunately, I accidentally ordered caster sugar, not icing sugar (I never knew there was a difference! ), I was baking at sea level (so my recipe was a bit off), and… well, I had hoped to use fondant, but it’s IMPOSSIBLE to make fondant out of caster sugar. The result was a grainy, gelatinous mess (which, incidentally, didn’t have gelatin in it, because of vegetarian issues…. but it doesn’t sound right to say it was a “grainy, agar-agar mess”). Anyways, as far as decorating the cake, it was a disaster, but the party was a HUGE HIT, I had the time of my life, and everyone really enjoyed the cake (or they pretended to, at least!